Bearded dragons are regarded as among the best pet lizard species, but not all bearded dragons are the same. Bearded dragons who make good pets have different traits than those who make good display or breeding specimens. While size, genetics and color are highly important to breeders and exhibitors, health and personality should be a prospective pet owner's primary consideration. By starting with a healthy lizard, you greatly enhance your odds for success. Purchase bearded dragons with alert, clear eyes; with all of their fingers, toes and tail tips; and with a clean vent area. Bearded dragons spread parasites among themselves quickly; if one animal in a group looks sick, it is better to avoid purchasing any other lizards in the group. Lethargic animals who exhibit depressed or listless posture should be avoided as well. If a bearded dragon eats and grows well, it is partially indicative of good overall health. Try to observe your prospective bearded dragon eating. Aggressive feeders quickly notice a cricket or mealworm and pounce on it. If a bearded dragon is appropriately warm but must be coaxed into eating, choose another lizard. Bearded dragons from a breeder are far more likely to thrive than lizards that have been distrubuted through multiple facilities. 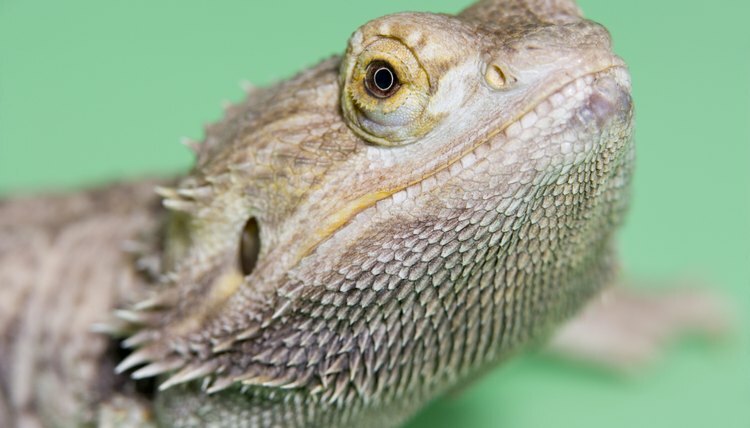 The more cages and other lizards a bearded dragon has come in contact with, the higher the likelihood that he has acquired a parasite or disease. By purchasing directly from the breeder, you will be able to obtain a more complete history of the lizard and obtain assistance if you need it. New keepers shouldn’t select bearded dragons under 6 inches in length or 4 weeks in age. Even at this stage, a delicate touch and excellent husbandry are required for success. At the other end of the spectrum, large adults are sometimes intimidating to first-time keepers. The best solution is to select a well-started juvenile bearded dragon between 8 and 12 inches in length. Designer bearded dragons are more expensive than normal or wild-type lizards. Hatchlings don’t display their full adult colors for some time, so bearded dragons are often sold based on projections of potential color. While it is fine to select a red, yellow or white bloodline for a pet, give measured attention to the color; premiums spent on color are better spent on a larger dragon with less color.